I adore fall. Growing up in Connecticut, I looked forward to its arrival every year. It meant the start of a new school year, a new season of parks and rec soccer (which in my town was treated, from what I gather, just about as seriously as football is in Texas) apple picking at Lyman Orchards, a welcome farewell to the humid weather of summer and so much more. Like clockwork, as soon as September arrived this year I switched to fall cooking and baking mode. I ushered in the season — though it still was, and totally felt like summer — with pumpkin spice cupcakes. Those were soon followed by this here cornbread and my take on the best chili I’ve ever tasted (stay tuned, it’s the topic of my next post!). The cornbread I enjoyed growing up was more often than not made from a box of “Jiffy” corn muffin mix. This is by no means a complaint; I loved its dry, crumbly texture and lack of corn kernels (those should be reserved for fritters alone, no?). Admittedly, I probably would still be eating it to this day if it wasn’t for the whole gluten thing. Happily, making cornbread from scratch is super simple, and this recipe makes THE BEST CORNBREAD EVER — moist but not wet, with just enough crumbliness combined with a touch of crunch from the whole-ground cornmeal. Oh, not to mention buttery — so much so that there’s no need to spread it with any extra (basically a requirement with the boxed sort), it’s perfect as-is. It’s so good that the first day I made it, David swore that every time he saw me I was either on my way to the kitchen to cut off another slice, already had a piece in hand or was happily munching away as I shot him a don’t-judge-me-yes-I-realize-this-is-my-one-millionth-slice-I-promise-I-won’t-eat-every-last-square-myself look. Please consider yourself warned of its addictive properties and, as always, enjoy! Preheat oven to 350°F. Grease a 9″ square baking pan with butter; line bottom and two sides with a sheet of parchment paper (keep overhang to help remove cornbread after baking). In a large mixing bowl, whisk together dry ingredients (cornmeal through sugar). In another bowl, whisk together butter and milk. (I didn’t cool the butter after melting and used milk straight from the fridge, so it appeared to “curdle.” It didn’t make a difference in the final product). Whisk eggs into butter mixture. Whisk wet ingredients into dry until batter is lump-free. Pour batter into prepared pan, smooth top with an offset spatula. 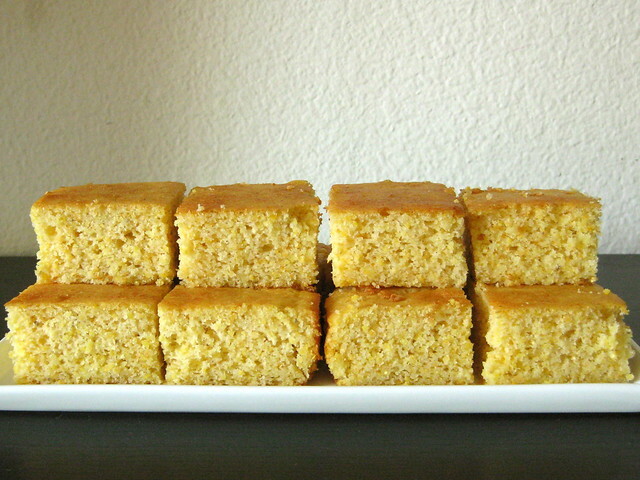 Bake cornbread in the preheated oven for 40-45 minutes, or until it’s golden brown on top and a toothpick inserted in the center comes out clean. Cool in the pan for about 5 minutes before running a spatula or thin knife around the edges and lifting bread out (use the parchment paper as handles) to a cooling rack. Cool completely before slicing (you may need to run an angled spatula under the cake in order to remove each piece cleanly from the parchment). ¹ Also quite delicious made with Vanilla Sugar for a less savory flavor. For a how-to, click here.